Prenatal Yoga uses postures, breathing, and meditation to help ease pregnancy, delivery, and the after effects of birth. The classes create strength, focus, flexibility and awareness through a gentle practice designed especially for the pregnant woman’s needs. 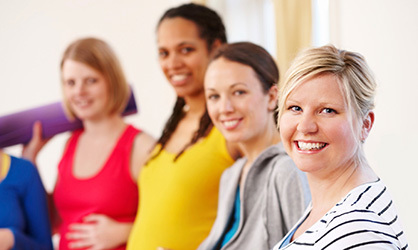 Prenatal Yoga classes provide a safe, peaceful and supportive environment for expectant mothers and are a wonderful way to connect with other mothers-to-be. Yoga helps to alleviate many of the discomforts of pregnancy such as heartburn, nausea, constipation, varicose veins, swelling, back pain and sciatica. The classes are appropriate for both new and experienced students. Discover this safe form of exercise that can be performed throughout your entire pregnancy. Because Pilates work engages your deepest core muscles, pelvic floor, hips and spine, you will develop muscle strength and memory that will help your body recover faster post-pregnancy all while enjoying the energy and support of a group class. Post-natal Pilates helps quicken the body’s recovery process, closing the diastasis and flattening the abs so that you will be back in your pre-pregnancy jeans in no time at all. Stretch, bond, and breathe with your baby in this special yoga series designed for new mothers and infants (8 weeks to almost walking). Meet other moms and babies while you strengthen and support post-partum and sleep deprived bodies with specifically chosen asanas and sequences. Every class will devote time for gentle hands-on yoga and massage for babies; aiding in their digestion and promoting the sleep-wake cycle. Bonding postures and playful songs are also explored. Dress comfortably and bring a receiving blanket for your little-little. The downward facing dog says “woof woof”! Play yoga with your toddler in this series for new walkers through 3s. Stories, puppets, music and song all bring yoga poses to life as little ones strengthen their growing bodies. Explore basic anatomy, focusing techniques, and the art of sharing, in this structured and supportive class. Healthy habits begin early in life, so take a deep breath together and discover that the ‘twos’ are far from ‘ terrible’! Every toddler needs an adult yoga buddy to participate. Both toddlers and adults should dress to move.